Shubh and Blissful Diwali To All on behalf of Hindu Samhati. Why no outrage over persecuted Hindus?By Richard L. BenkinChicago, IL, United States, — There have been several attempts at genocide since the middle of the last century. European Nazis murdered 6 million Jews in the 1940s. In the1960s Fulani-led Nigerians slaughtered around 1 million ethnic Ibos who formed the Republic of Biafra. Three decades later, majority Hutus murdered almost 1 million Tutsis in Rwanda, and Serbs did the same to about 10,000 ethnic Albanians in Kosovo. Ethnic Arabs are still killing non-Arab Sudanese; so far over half a million. WHY HINDUS ARE ANGRY IN KARNATAKA ? I was born in a Catholic family. My uncle was a priest, a wonderful man of warmth and compassion and I spent most my early years in Catholic boarding schools. When I was young I wanted to become a missionary and to ‘convert’ pagans in Asia. What I was taught by priests was that Hindus worship false gods and they needed to be brought back to the True Word by Jesus Christ. 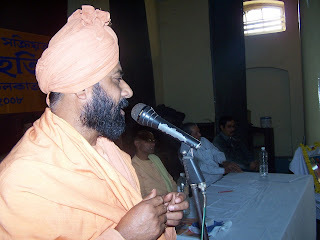 The leading Hindu monk of Murshidabad district Swami Pradiptanandaji Maharaj has received a threatening letter from the Murshidabad unit of HUJI and SIMI. With filthy language they have threatened Swamiji to stop his activity. Otherwise he will be killed. They also ordered in this letter, to all Durgapuja committees of Beldanga town, where Swamiji's Ashram is situated, to stop Durgapuja next year as the sound of these Pujas vitiate their body and soul and disturb their Namaz. If they don't obey the order then all the pandals will see bloodbath. District administration took the letter seriously and increased security arrangements in the Ashram. But at the same time it has restricted Swamiji's movement. Statesman News ServiceBALURGHAT, Oct. 6: People belonging to two communities clashed at a Durga puja pandal at Dewoor, under Kumarganj police station in South Dinajpur district this morning, forcing police to fire in the air, burst tear gas shells and make a baton-charge to bring the situation under control.The South Dinajpur district magistrate and the superintendent of police were among some 20 persons hurt in during the commotion. The police arrested 26 people including four women over the incident. Section 144 of the CrPC has been promulgated in the area and two platoons of BSF have been deployed to help the police keep the situation under control.The incident caused tension in other areas too, with the residents of Baul, which is close to Dewoor, blocking the Balurghat - Malda state highway for three hours after the incident. passes away on October 5, 2008. Calcutta University in the subject of his specialization Tuberculosis and Chest Diseases. He has to his credit 12 original scientific papers published in leading medical journals. For a long spell of 10 years (1964 – 73), he was the Chief of the Editorial Department of the Journal of the Indian Medical Association. Since 1974, he is practicing in Calcutta as a Consulted Physician and Cardiologist. In last State Committee meeting of Hindu Samhati, it is decided that all units of HS will organise Ideological book Stalls in their respective areas. Ideology oriented books should be collected from various publishers. HS central office will help the workers to collect the books on credit. These stalls will help to propagate our cause.